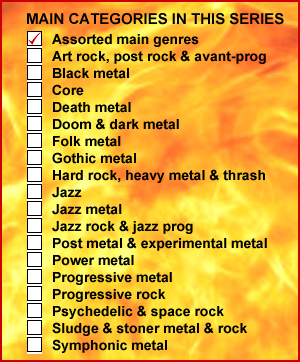 Metal State often receives ten invitations a day to review new albums. In physical terms, it would be impossible for a whole battalion of writers to do full reviews of so much new music. In practical terms, we don’t want to overwhelm our readers with so many posts that few would have or make the time to read them all. How then to do some justice to the many outstandingly good submissions we take in each day? One way to help the best bands reach a wider audience is to compile digests of new albums, and that’s what I’m starting to do here. The graphic shows what type of ground I’ll be covering in the next few weeks, months and the rest of my life. After that, I’ll do mixed digests of different flavours of metal and other music as soon as possible after it arrives at our dungeon. For now, I’ve sorted my best albums received so far this year into main categories. You can see them in the graphic on the left. I’ll tick off each category as I add posts.